Not quite Friday (but feels like it) funny | Watts Up With That? 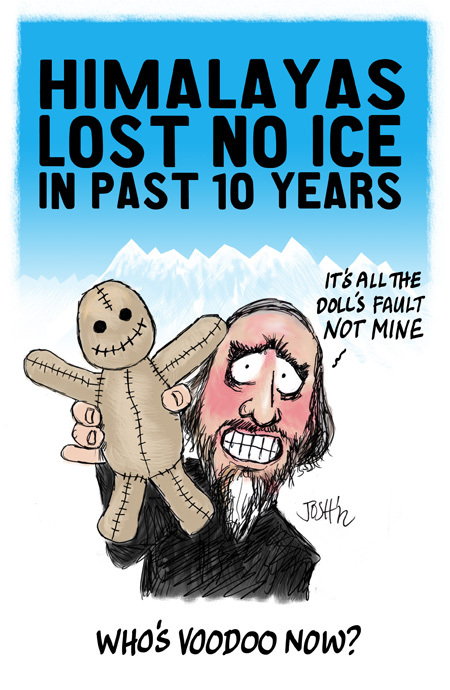 Josh is moved by the revelations of the lack of Himalayan glacier melt in the last 10 years to do some voodoo cartooning. February 9, 2012 in Humor, IPCC, Satire. The climate zombies are not going to be happy. Apologies for going so far off topic,but if you`re in the uk ITV1 has a programme starting at 7:30. I`m hoping for something other than Monbiots viewpoint….but i wouldn`t bet a cheese sandwich on it. I’d be surprised if Pachauri didn’t have an Anthony Watts doll. Anthony, any strange pin prick sensations lately ? Gaahhhhh!!!! Non_biots on the bloody programme. Bush paid off the people who developed the photos for NASA. Has Al Gore been sighted in the Himalayas? Before you go and choke on the joke: What says the data? Ol’ Patchy is gettin’ railroaded! What a moron everyone knows for the doll to work you have to use pins. If only they had used pins the embarrassment of being wrong could have been avoided. uhmm, ….. it says, the Himalayas have lost 4 Gt/yr of water, +/-20 Gt/yr…….. in other words, they’re not really losing anything….. Even arch-warmist, newly-half skeptic Spiegel in Germany reports about no mass loss of Himalayan glaciers since 2003. Thus spoke the data: Nevermore. When aren’t glaciers moving and melting? Ice forms in high altitudes and falls slowly to lower altitudes where it melts. A net change of 0 means the flux is stable. Everything is always bad! > Thus spoke the data: Nevermore. And, thus spoke the data: Neverless. Bob Diaz, good one, but I saw that punchline coming from a mile away…. Thanks for that! Bob Hope is awesome. But I am looking for other sources than Spiegel or Guardian. Those people are no scientist (quite the opposite many times). There should be same data tables and graphs with maps of measuring stations so that one can get a view. This will of course not give the whole picture I guess but something to put the foot on. The Nature paper (http://www.nature.com/nature/journal/vaop/ncurrent/full/nature10847.html#/ref2) also includes a couple of other points. – The rate of melt of the arctic ice caps is much less than previously measured. – There is no mention of any acceleration in the rate of ice melt. 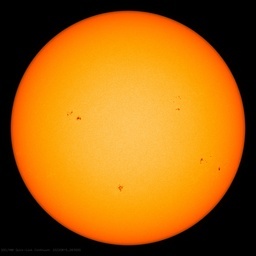 There extreme view (that Bob Ward and John Cook of Skeptical Science like to quote) is Velicogna 2009 Geo Res Letters. It seems that if you base your data on a narrow time frame, or some local observations (the Himalayan Glacier prediction), you will obtain alarmist conclusions. Look at the wider, longer-term context and you get a more moderate conclusion. That’s what happens when the planet naturally emerges from one of the coldest periods of the Holocene. Glaciers melt, imagine that! Yes I can imagine glaciers melting. But many are imagening that they are not, despite citing (without knowing?) a paper that clearly shows melting is the case. There is a potential risk that we encourage this melting. No one denies that co2 warms the planet but suddenly some extra man made co2 does not…due to…magic?